I used to have a routine of going to the gym for about an hour after work, three times a week and then on Saturday morning. 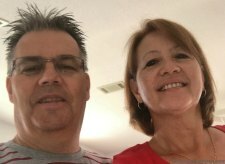 Since we retired, I haven't join a gym but do try to get some exercise by walking a few hours a week. We are so lucky to be living near two awesome cities. In NC we live about 15 minutes from downtown Wilmington. We enjoy walking around this old city and admiring the historic homes that line the streets. The Riverwalk is also downtown and walking along the Cape Fear River is one of our favorite ways to get the exercise we need. During the fall and winter months we live in Florida. We are about 10 minutes from downtown Lake Wales. Like downtown Wilmington, downtown Lake Wales is also an historic area. What we love about walking around here is that we get to enjoy a visual treat in the form of murals that cover many of the sides of the buildings. 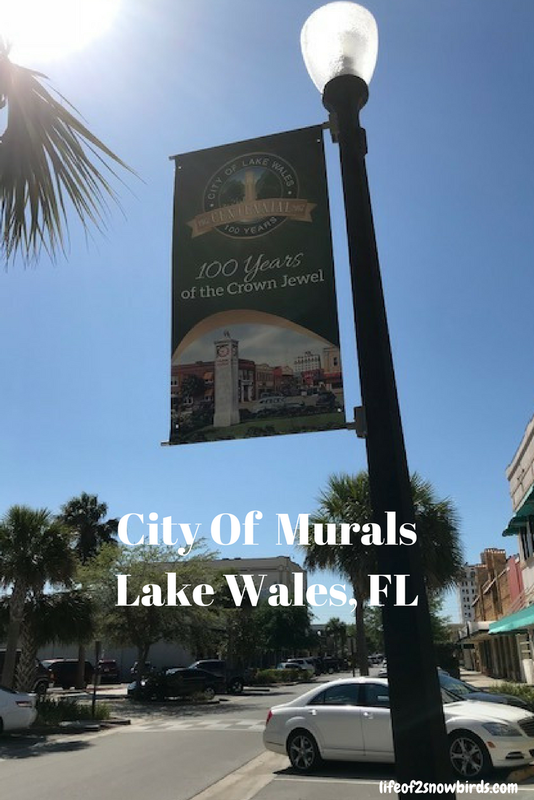 Not only are they beautiful and amazing, but many of them tell the history of Lake Wales and stories about the people who made an impact on the town or who were special to the town in some way. One of our favorites is a mural of someone who was a fixture on the streets of the city. Jesse Williams was a greatly respected shoe shiner for an amazing 6 decades. Friends and family of Jesse funded this project. 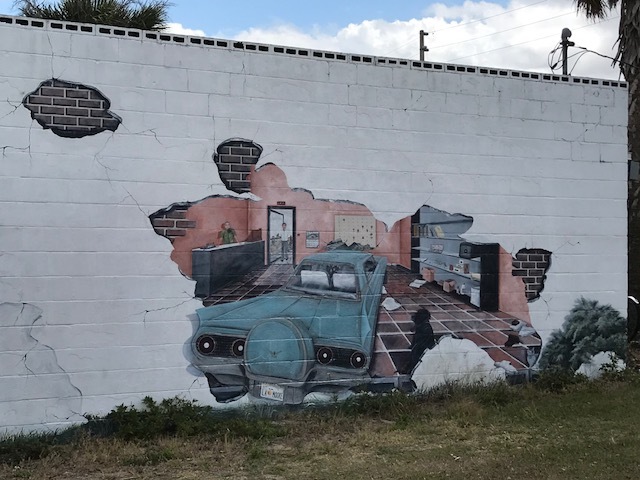 Tom Freeman, a Lake Wales artist, painted many of the murals downtown. He also was a very influential adult art teacher. 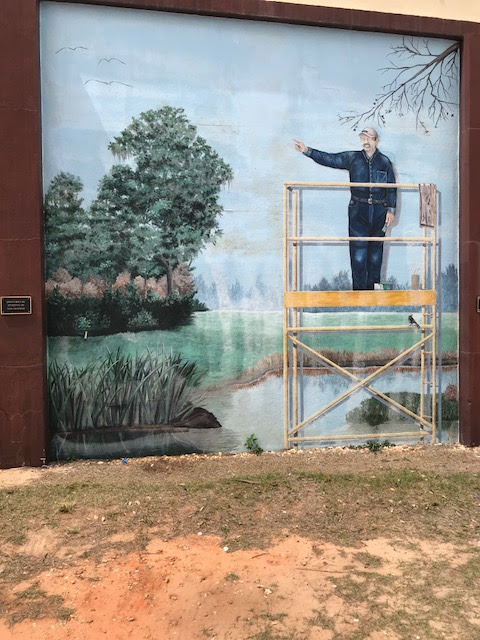 So very respected that his students wanted to honor him by painting a mural of Freeman painting a mural. The Barrel was the place to be if you wanted to get the scoop on what was happening around town, and also if you wanted to have breakfast or lunch and socialize with friends at the same time. 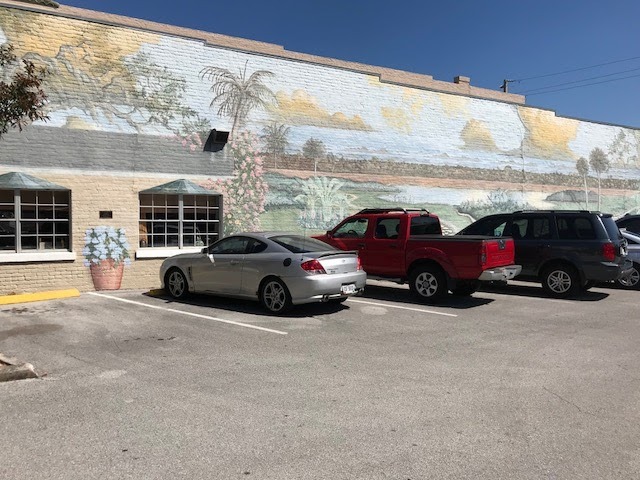 This mural was funded by people who had very fond memories of this special restaurant. F.S. McLaughlin was the principal of Lake Wales Schools for almost 4 decades and founded the Lake Wales Charter Schools. Also seen in this mural is his wife who was an integral part of the success of the school system. 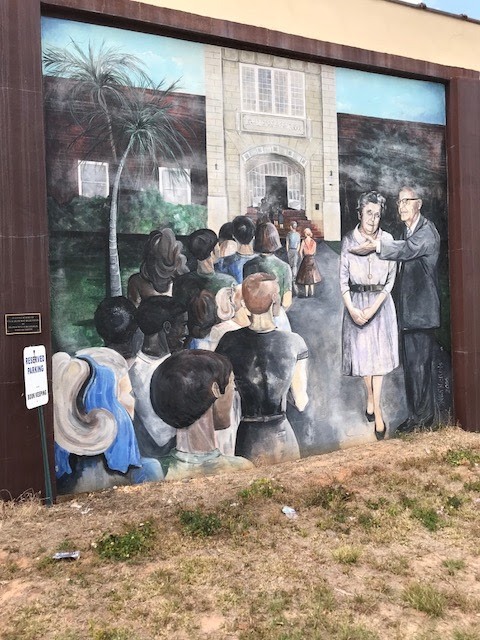 The mural was funded by Frank McLaughlin Jr. and when it was dedicated in 2006, many former teachers attended. The community has always been proud of the Lake Wales High School Band and Scottish Unit. 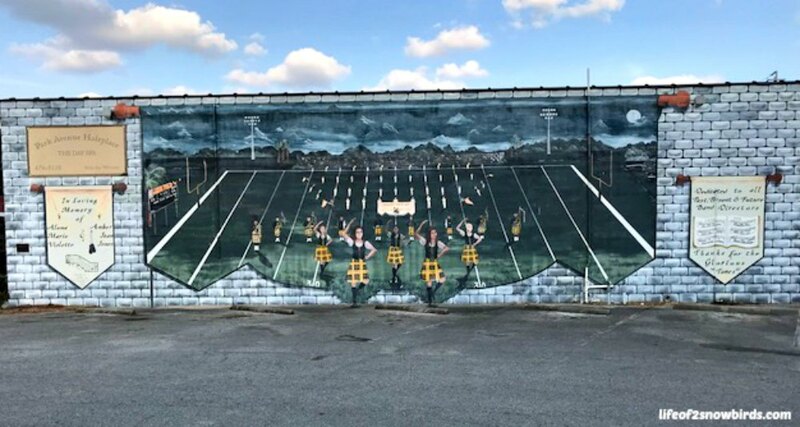 After a tragic accident involving two of the young dancers, they got together to fund this special mural. Thousands of .supporters showed up for the dedication of this mural to the two girls. 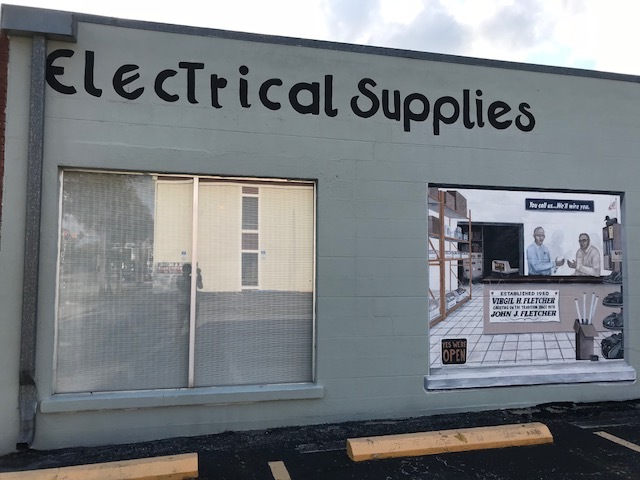 This mural was funded by True Value Hardware and was the Tom Freeman's last outdoor mural. It is called Florida Flowers and showcases the flowers and animals of Florida. 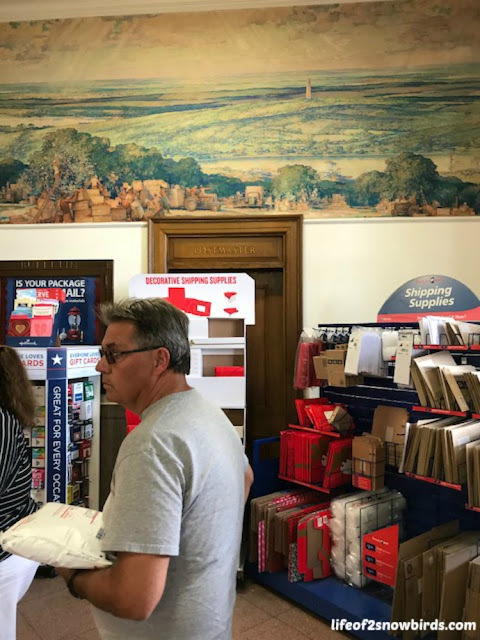 The United States Post Office fully funded this patriotic mural that graces their annex. We love how the flags wraps around the two corners of the building. Soko is in front of one of a few indoor murals. This one is called Harvest Time - Lake Wales and is in the post office. The citrus industry is a vital part of this area's economy. We live in the middle of the orange groves which makes our neighborhood smell heavenly! 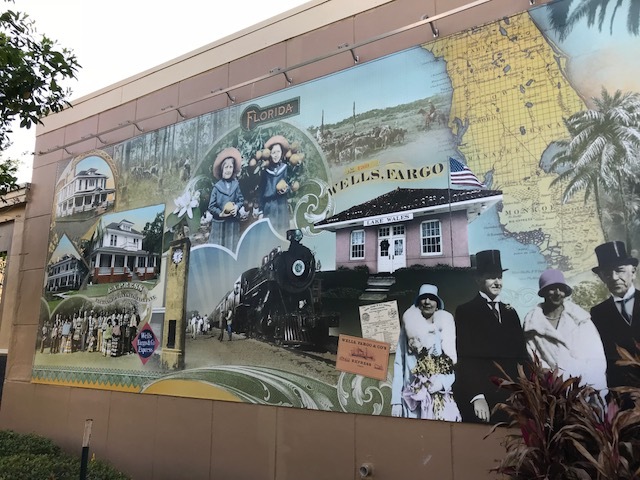 Wells Fargo funded this printed mural. 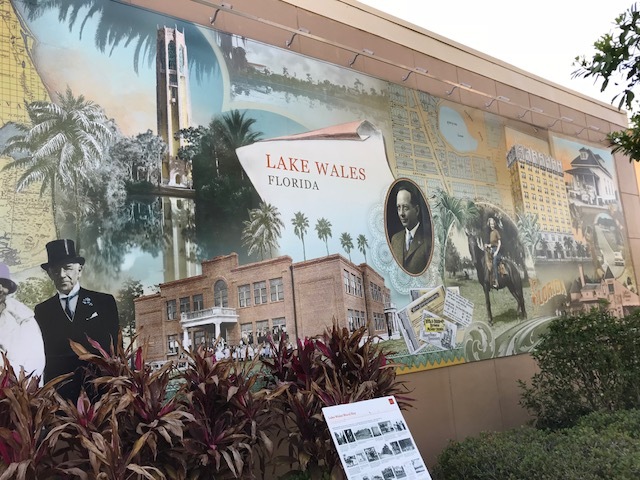 It decorates the city's town square and is a composite of various historic photographs of Lake Wales. 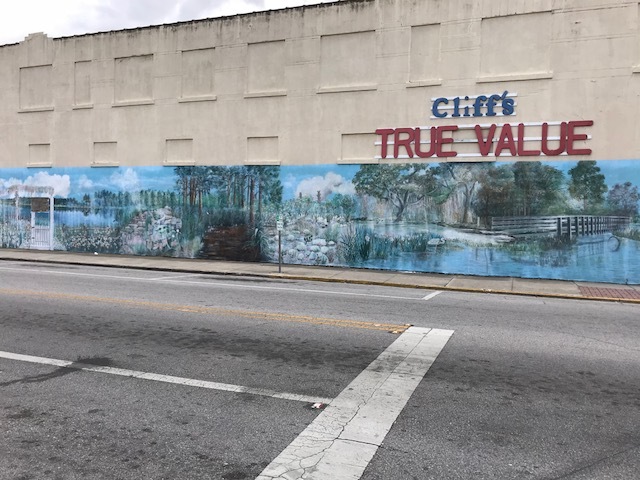 Featured in this mural is Bok Tower and Frederick Law Olmsted, the landscrape architect for Bok Tower Gardens. The grand Dixie Walesbilt Hotel is featured and I am happy to say that it looks like it may be opening again, or at least we saw that there was some kind of restoration going on inside this gorgeous building. Our favorite street, Spook Hill, has a spot on this tremendous mural. If you are ever in in Lake Wales, go to the bottom of this street, put your car in neutral and wait for your car to magically drive up the hill on it's own! 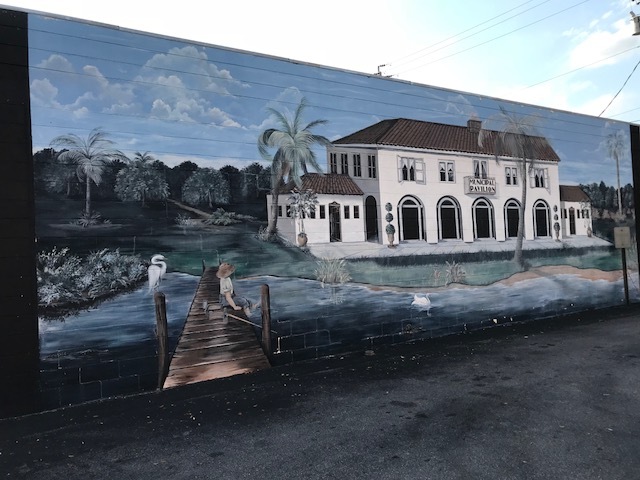 "Old Timers" of Lake Wales fondly remember this building, that was on the western shore of Lake Wailes, and funded the painting of this mural. Inside the City Pavilion you could find dressing rooms, concession stands and a gathering place for community events. 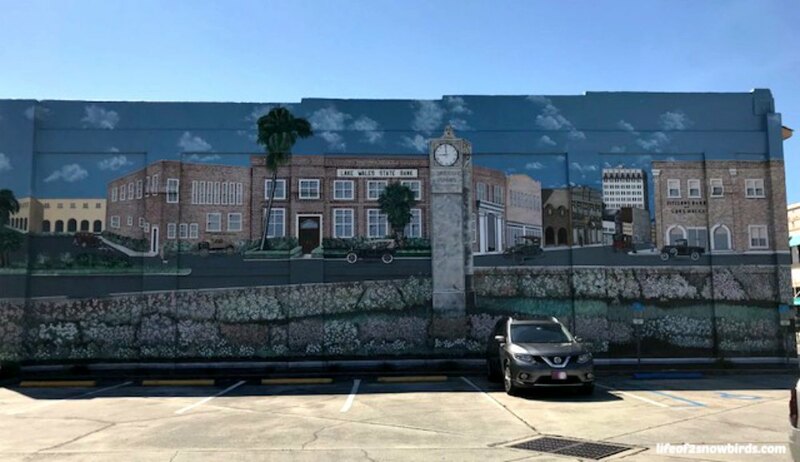 The Downtown City Mural depicts downtown Lake Wales as it looked in the late 1920's and early 1930's. Last year we watched, for many weeks, this amazing two story mural getting a touch up. 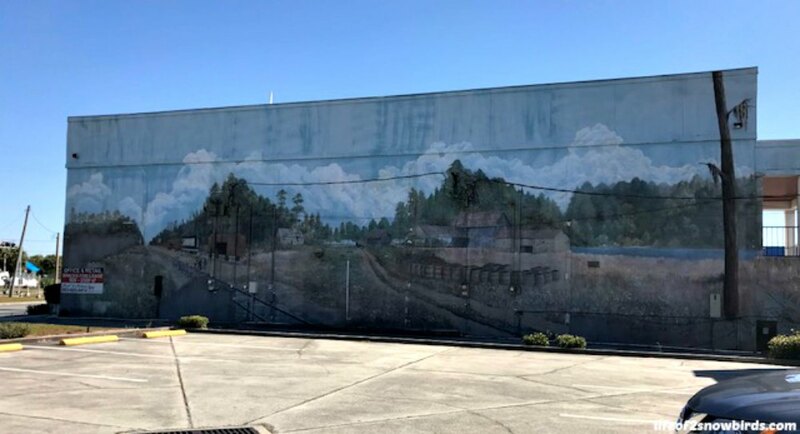 We voted this mural as being "Most Amusing"! 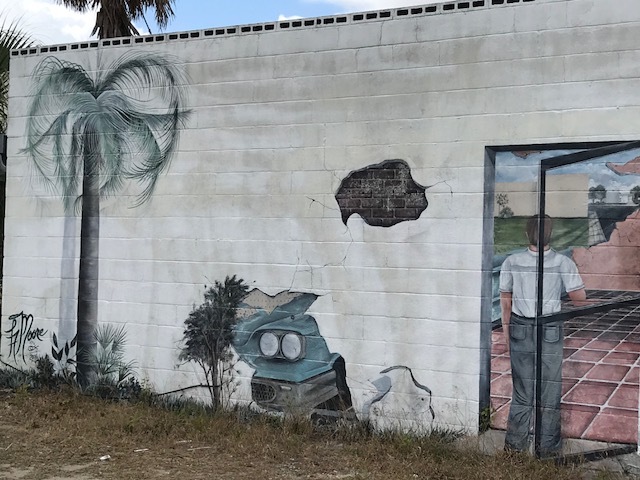 One side of the locksmith's building shows a 1958 Thunderbird crashing into the building and on the opposite side, you see it coming out. 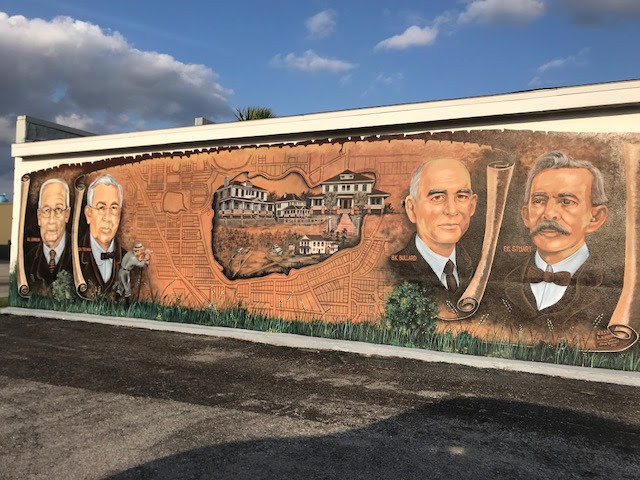 These four businessmen, BK Bullard, EC Stuart, GV Tillman and CL Johnson, are credited with founding Lake Wales. Look at the names of the streets while you are walking around town. It will probably be named after one of these gentlemen. 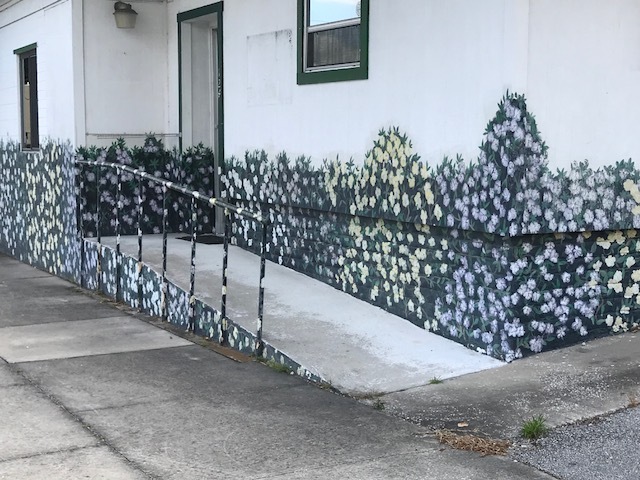 A group of amateur artists created a beautiful mural of azaleas that is one of my favorites. I love how it is so simple but so appealing at the same time. I also like how the artists continued the design on the railing. 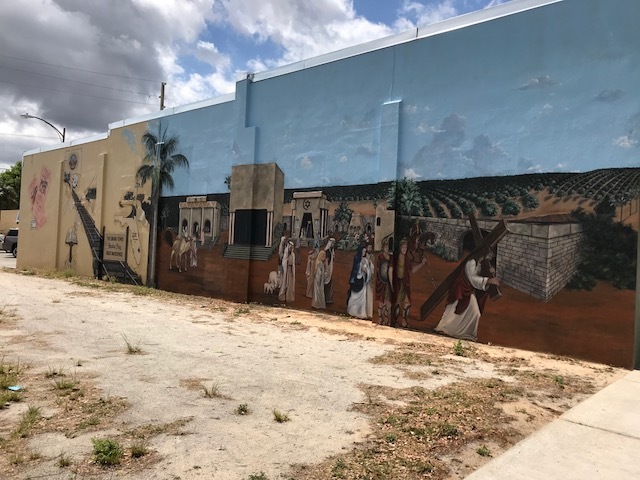 Locals funded this mural of the Passion Play that was performed every year at a theater in Lake Wales that is now closed. Residents volunteered to participate in the play and still have fond memories of this annual tradition. 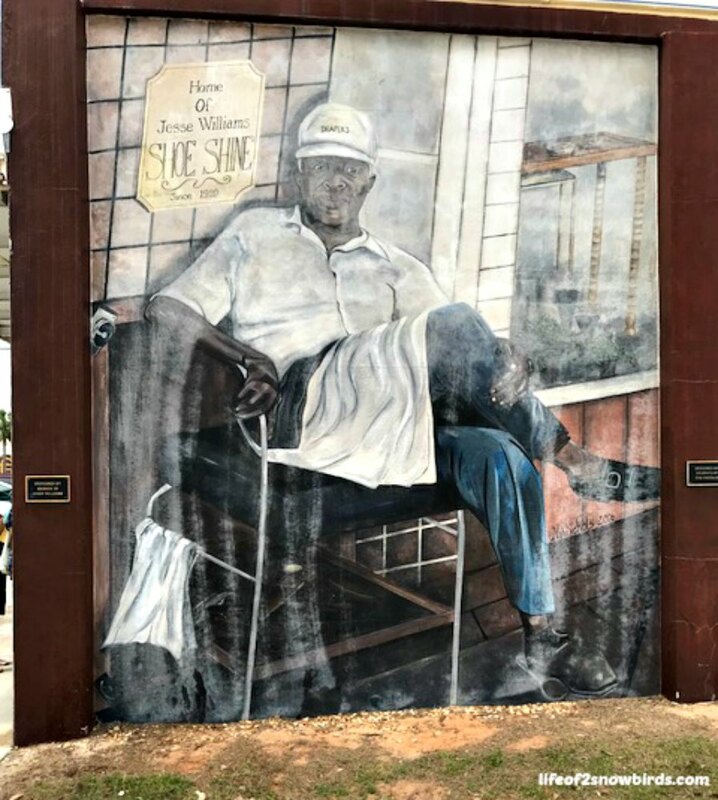 Friends and family of the current owner of the Fletcher Electric store, John Fletcher, commissioned artist Lisa Moore to paint this mural of his dad, Virgil Fletcher, passing the torch to his son. This was done while John was on a two week hunting trip. When he got back, family and friends surprised him with the reveal. End Of A Perfect Day In Paradise is the name of this mural. The mantra in our snowbird community is Another Day In Paradise and you can see that on our shirts, along with our community logo. The feeling that we are living in paradise is felt among many Floridians I'm sure, especially those of us formerly from the coldest areas of the north. The turpentine industry was one of the original industries when Lake Wales was founded. 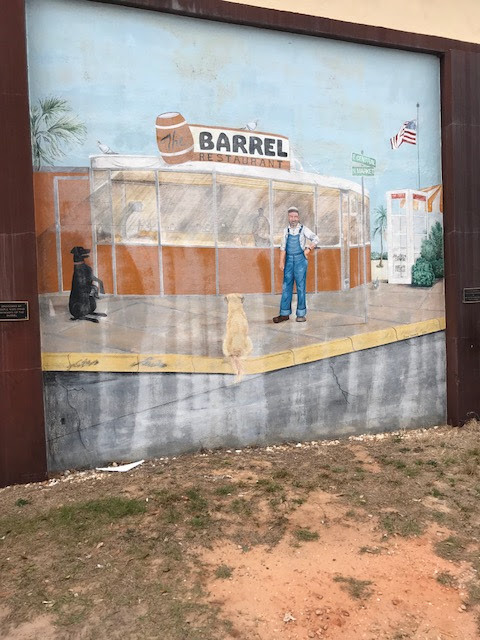 The Turpentine Mural helps us remember this fact about the area. 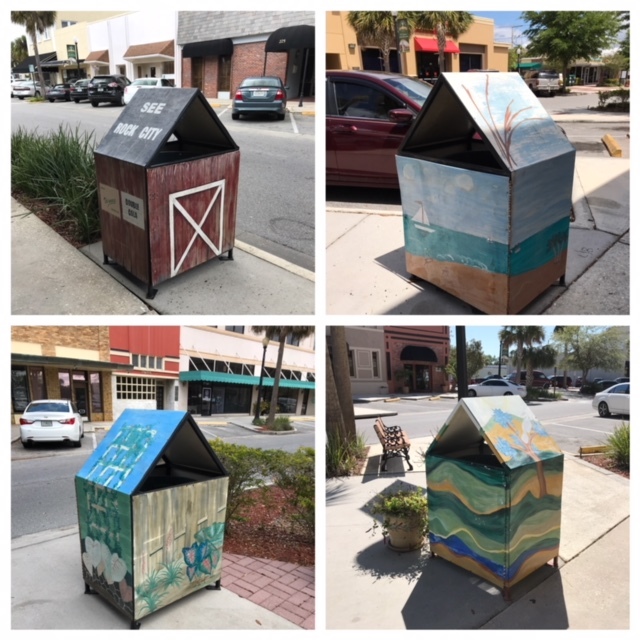 And, of course, if you are the city of murals, your garbage pails should be as colorful as the rest of the town! Very nice artwork! I'm impressed! Each one of them is really beautiful and some of them are just fun. So happy to have them to enjoy! Beautiful pictures! Thanks for sharing on To Grandma's House We Go! Wow! So many beautiful murals. Yes. They are all over the city! What a wonderful way to celebrate special people and things! I so enjoyed this tour. I'm featuring your post at the Hearth ands Soul Link Party this week. Thank you so much for sharing it! Thank you so much, April. So happy you enjoyed this post!! Lake Wales is in central Florida about 1 hour southwest of Orlando. It sure is a wonderful life being able to "fly" down to Florida when it gets cold up north isn't it? What a great collection of murals!